An uprooted tree appears to rest precariously on a corner wall at Laurel Hill Cemetery along Kelly Drive on Tuesday, March 3, 2018. In reality, the tree is tethered to prevent if from falling into the busy roadway, said a cemetery spokeswoman. I think it was Ben Franklin who said something along the lines of there being two certainties in Philadelphia life: Death and soda taxes. Of course, there are steps you can take to at least delay the former. On Monday afternoon, for me, that meant not commuting home along Kelly Drive. You see, that morning, I looked up the hill between the Route 1 overpasses and Hunting Park Avenue traffic light along the Schuylkill River in East Falls. If you passed it in the past two days, you know exactly what I'm talking about. If you haven't, well, you've seen it now courtesy of that photo atop this post from PhillyVoice photographer Thom Carroll who risked life and limb to snap it Tuesday afternoon. In the interest of public safety, I reached out to the good folks at historic Laurel Hill Cemetery to talk about it. Short phone conversation shorter: They know and have taken steps to ensure they don't have to comp someone a pricey burial and Death By Tree tombstone on account of it. The woman who answered the phone there Tuesday afternoon said the mammoth tree has been secured atop the hill. She said that it looks a lot worse from Kelly Drive – a vantage point she walked down to see – than it does from the area near Harry Kalas' final resting place. "Cemetery Superintendent Bill Doran is aware of it and has been working to get it removed," said the woman, who asked not to be named for the sake of this important story. "He's talked to the city, but it's difficult to find a time to close Kelly Drive down, which we'd need to do to remove the tree." 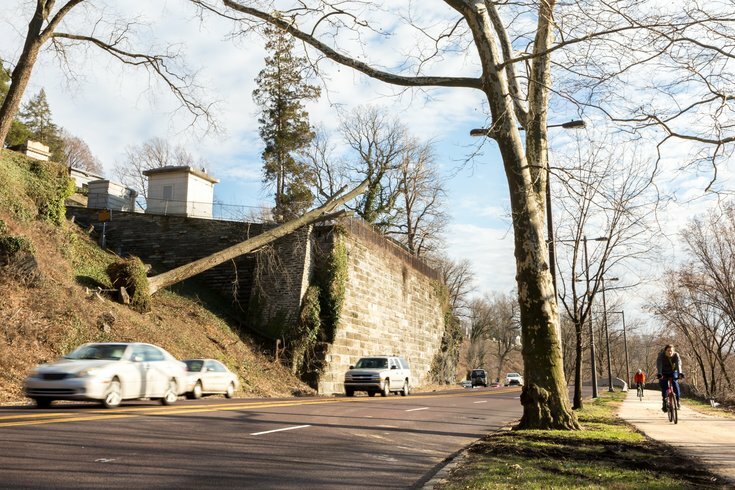 She noted that the Fairmount Park arm of city government had been out trimming trees, including the one that was ripped from the ground last week. There are other challenges as well. "We're also waiting for word back from tree-removal services, but I imagine they're very busy at the moment," she said, referring to the thousands of trees downed by the weekend nor'easter. They look to remain busy this week with the second nor'easter in five days due to hit the area overnight Wednesday.